Our senior management team spend considerable time working closely with our committee members and supporting and providing them knowledge around these key components of committee governance. What is the fiduciary duty of an owners corporation committee member? What does it mean as a volunteer committee member? How should committee members handle conflicts of interest within an owners corporation committee? In this discussion with Dr Nicole Johnston, Academic at Deakin University – Property & Real Estate, we provide information and guidance for volunteer owners corporation committee members around their fiduciary duty and handling conflicts of interest. Michael Darby: Moving on to, I guess, a part of that is committee liability and their fiduciary duty? Dr Nicole Johnston: The difficulty for being on a committee or one of the difficulties of being a member of a committee is not only the work that you do in your capacity as a volunteer acting on behalf of a larger group and making those decisions, which is really commendable and can be quite strenuous at times, there are also legal duties that committee members need to be very much aware of when they’re making decisions on behalf of the Owners’ corporations because that’s their role. Their role is to make decisions on behalf of the Owners’ corporation about that particular scheme. And so, they need to be aware of that they’re not only statutory duties and in Victoria Section 118 of the Owners’ Corporations Act provides specific duties in relation to the way that they make decisions. That’s where you’ll see things in relation to good faith that they must use skill, care and diligence in making those decisions and they also must not make improper use of their position to have an advantage for themselves. So, they need to be very mindful of that statutory provisions when they’re making a decision, they need to be very careful about making decisions, they need to make considered decisions on behalf of others. Michael Darby: But then how would you define it? Dr Nicole Johnston: Yeah. Well, there’s a little bit of an overarching, I suppose, legal philosophy behind fiduciary duties and It’s about loyalty, it’s about someone being responsible for someone else and being loyal in their decision-making in relation to, you know, when we talk about Owners’ corporations, in relation to their scheme. But there are two specific duties that really are discussed mainly when we’re talking about fiduciary duties and one is a no-conflict rule and the other is a no-profit rule. So, what it’s really saying and this is what I would be, you know, not to give a legal advice but I would be thinking carefully about when a committee member makes a decision, I would make sure that they are clear about any conflicts of interest. So, if you have any type of relationship with a third-party that’s being where there may be being discussed; so, if you have a connection to a service provider that may be providing a services or quotes in relation to something to be undertaken within the scheme, they should be very open and transparent about any type of relationships they have with people like that, whether it’s direct or indirect, I would be very clear about that. I certainly wouldn’t be voting and I will be removing myself from any meeting that is discussing anything relating to a service provider where you have any type of connection to. So, that’s one part of the rule. Michael Darby: So, that’s important to make as clear once again and that’s very reasonable to say, if a committee member does have a conflict, that they’re not in the room for the discussion-? 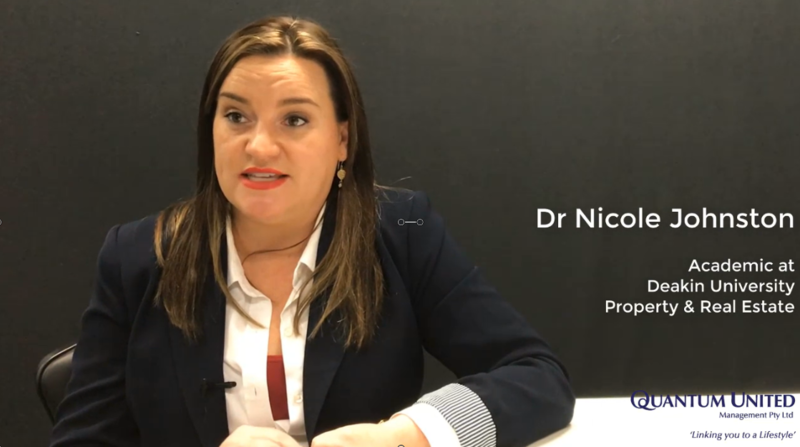 Dr Nicole Johnston: I think even- and so, we talk often about real and perceived conflicts of interest but I think if you’ve got any connection whatsoever in relation to a service provider, I would absolutely remove myself from any type of decision making. So, I would disclose straight up that there is a potential relationship or there’s some type of connection in relation to that particular service provider or in relation to the decision that’s being made, I would be very clear with everyone about that. I would also then remove myself from the room when the decision is being made just to take care of any type of connection or interests that you’ve got some sort of influence in relation to the decision being made. And I certainly, wouldn’t be voting on the decision. Absolutely. Just remove yourself from it so that you’re not even getting tangled up in it and this is about being open and transparent to everyone else in the room. So, the decision can be made with all the information on the table and people can have a look at all the information that’s there. So, that’s really important. And the second part of the fiduciary duty is the no-profit rule. So, people should not be making any type of profit from any decision that’s being made. Michael Darby: Via talks about the committees being unregulated, there aren’t procedures, and to me, that meant itself to say that, you know, you can create a policy around conflict of interest that now members have to comply with, is that reasonable? Dr Nicole Johnston: I absolutely think, I think, you know, and I’ve been reading an article recently about, you know, the strictness of legislation and the fact that we should be thinking also about some softer rules that, sort of, we should take into account when we’re looking at these types of corporate forms. Yes, we have very clear prescriptive rules in the legislation that needs to be followed but we also need to be thinking about the practicalities and ensuring that everyone’s open and transparent in relation to the decision making. So, I absolutely would be making it very clear that that’s the way it should be and people, I think, it just then helps with the decision making and there’s never any conflict around that someone hasn’t been open and transparent in relation to their connections with the parties. I think it’s a problem that plagues this area; conflicts of interest both from, you know, the developers’ interaction with other people then continue to be part of developments having associated entities. I think we are in an environment where there’s a lot of conflict of interest which then adds to the conflict between parties and it certainly adds to the conflict within the committee. So, be open and transparent and then, you know, it alleviates that sort of tension straight away. Michael Darby: I think it’s so important, the Act can go alot further to can’t it they should be prescribing this in detail so it removes any doubt to support how Committee’s operate. Dr Nicole Johnston: Yeah. And you know, in other states they do. So, in Queensland, they’ve got really clear rules, a very clear provision in the legislation about conflicts of interest and exactly how that had to be dealt with and it is about removal. And they also have a code of conduct in relation to committee members about how to deal with these sorts of things and what their knowledge is based on in relation to the act and that they are to be involved in any of these sorts of, you know, even if it’s perceived, remove yourself. Great article. I perceive a conflict whereby an OC committee in Victoria wants to pay for maintenance on the private property of 9 roof top owners and has put a special resolution to the AGM. Vote 23% against; 65% for. Decision interim. Under this plan of subdivision the roofs of 9 apartments are designated as private property and on their title. Roof insurance is paid by the OC but not the public liability if a sheet of colorbond falls and damages people/property. That I guess will fall on all owners. The maintenance is clearly designated as the responsibility of the private owner. Problem is that two of the “for” votes came from one committee member and a new committee member who own the private property affected plus the other 4 members of the committee and all other 7 owners of the private property. Surely a conflict of interest, yet the OC management company ignores requests to advise the AGM meeting of possible conflict by the two owners who voted in the affirmative. I can’t seem to reconcile section 118 of the ACT with conflict – but I’m not a lawyer. I would love to quote a section more definitive if you can help! Thanks for your comments Alan. It was good to talk with you on the phone to better understand, work through your situation and respond to your questions. All the best with your owners corporation.